Most airport towers are built with Lightning Protection Systems. However, serious incidents do occur. 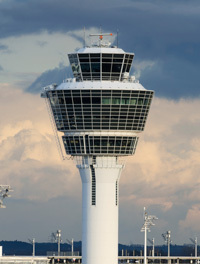 According to a recent Associated Press story, a lightning strike on the airport tower at Baltimore/Washington International Thurgood Marshall (BWI) Airport injured an air traffic controller and revealed a potential vulnerability that could affect towers at other U.S. airports. In the BWI incident the Lightning Protection System failed, most likely because the cable was cut during a construction project several years earlier. An air terminal, down conductor, and at least one ground plate or rod for each beacon tower, should be installed. The air terminal should be installed at the top of the tower with the tip of the rod extending not less than 150 mm (6 in) above the top of the beacon. Down-conductor cables should be securely fastened to the surface of the tower leg at 150 cm (5 ft) intervals with suitable bronze fasteners having bronze or noncorrosive metal bolts. Sharp turns or bends in the down conductor are not permitted. All connections of cable-to-cable, cable-to-air terminals, and cable-to-ground plates or rods must be made with solderless connectors or noncorrosive metal. The down-conductor cable shall be securely attached to ground rods or plates placed at least 60 cm (2 ft) away from the tower foundations. The ground rod shall be driven into the ground so that the top is at least 150 mm (6 in) below grade. The down-conductor shall be firmly attached to the ground plate or rod by means of a ground connector or clamp. If an airport is located in an area with a high incidence of lightning, the Catenary System (used to protect the Space Shuttle) can be used but would be very costly. Sandia National Laboratories (SNL) recommends a less costly (but equally effective) alternative. SNL recommends installing a ground ring complemented with ground rods and radials. The presence of sparks in the incident at BWI indicate a lack of equipotentiality. This problem can be identified with a ground resistance tester like the Fluke 1625-2 GEO Earth Ground Tester and other Fluke test tools. Measure soil resistivity in different areas and soil layers with the Fluke 1625-2 to identify the optimum low-resistive soil area in which to extend the grounding system. Use the resistivity values of different soil layers to determine the type of electrode to use and the depth it should be buried to obtain a lower ground resistance value. After the grounding system has been improved based on the measurements in Step 1, measure ground impedance with the 1625-2. 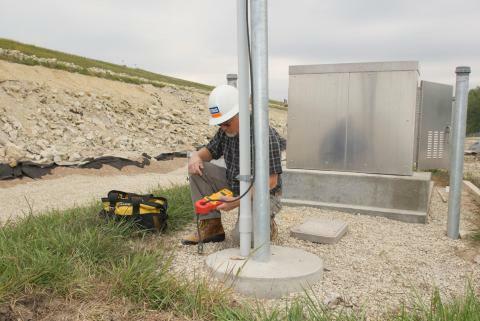 This value is very important because lightning is a high frequency event and the ground impedance measurement will help to determine the grounding system's ability to properly dissipate the energy from lightning. Measure continuity of the lightning protection system Down Conductor. This will determine whether the Down Conductor is at the same potential as the other components of the electrical system. All components need to be at the same potential during a lightning event to avoid catastrophic damage. Install a surge suppressor with adequate current capacity per IEEEC.62.41 to protect electronic equipment. 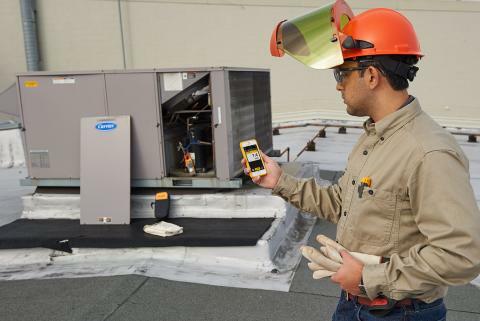 Identify loose connections and overheated transformers and conductors using the 1625-2 to measure resistance values or the difference in potential between two points. 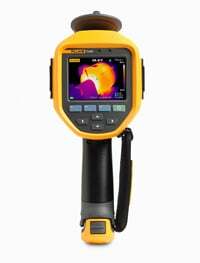 You can also use an infrared camera such as the Fluke Ti400 to show temperature differences between components. 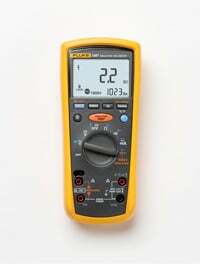 Identify insulation breakdown by measuring insulation resistance with the Fluke 1587 Insulation Multimeter. 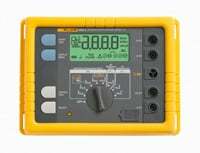 Go to Fluke News article "Don't Forget the Grounding System"